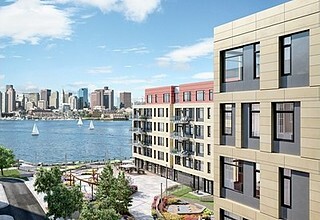 The Mark at DeNormandie Wharf is the newest luxury residential condominium community on the East Boston waterfront. The Mark is a full service building with 107 residences, a community of connectivity and convenience on the water. Here you will find a collection of thoughtfully appointed luxury condominium homes in a breathtaking setting, where the water offers the perfect tonic for effortless living. The six story building, developed by The Davis Companies, is a short walk from the Reelhouse Restaurant, Lo Presti and Piers Park on the waterfront. The Blue Line T stop at Maverick Station (0.2 miles) and the Water Taxi station next door (0.1 miles) offer convenient commutes to downtown Boston. 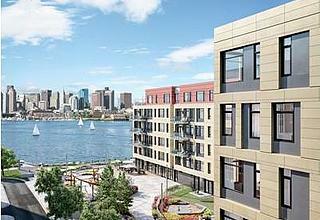 Welcome to East Boston’s new vantage point.